These waterfalls are fun to visit any time of year. You can usually walk right up to the falls and even in behind them. 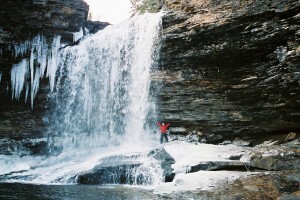 The Upper Wolf River Falls are located near Dorion. From highway 17, take Fish Hatchery Road west and follow it for 6 km staying on Fish Hatchery Road through three right turns. After 6 km take a right onto Wolf Lake Road and follow it for 20km. You will pass Wolf Lake, and cross three bridges. After the third bridge (over the Upper Wolf River), take the “road” to the right. This is a two track road that is in decent shape. Follow this for 2.25 km. The trail starts a point where the road bends to the left. The road is wider at this point, and there is space to park on the right. There are no signs. The trail is to your right, and goes down to the rim of the gorge. When you reach the rim, take a left. After about 2km you will see the beginning of the descent into the gorge. It is a steep, natural stairway. This only gets you part of the way down. The trail continues to the left and right. The right will lead you to the top of the falls. The left will lead you to a wooden ladder and some ropes that will help you make your descent into the gorge.